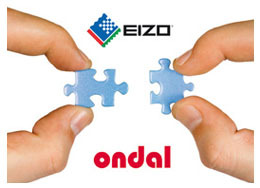 Karlsruhe – Hünfeld, Germany, October 27, 2010 – EIZO GmbH, Display Technologies and Ondal Industrietechnik GmbH announce their partnership to provide monitor carrying systems, monitors and accessories as system solutions. These are suitable to use in interventional radiology as well as in standard and hybrid operating rooms. EIZO's and Ondal's solutions consist of prewired carrying systems (Monitor Ceiling Suspension, MCS), precisely attuned to EIZO's monitors and image management systems. Prior to delivery, the carrying systems are connected to the monitor components to greatly simplify subsequent fittings. EIZO monitors can then be interchanged in the monitor carrying system simply by plug-and-play, and no longer have to be extensively wired up on site. The components used by both manufacturers are designed and tested as a system solution, saving the customer time and money. The systems can be ordered as complete or individual solutions from the relevant manufacturers. As well as conventional monitor technology, the EIZO and Ondal solutions provide the possibility of upgrading operating rooms and radiology systems to new large screens. Images can be shown more flexibly on large screens, which improves the procedural steps in diagnosis and treatment. EIZO Display Technologies has years of experience in the development of monitor solutions for medical technology. This includes monitor electronics and accessories such as image management systems and DVI transmission lines, for example. Ondal Industrietechnik GmbH has been developing ceiling, wall, and mobile equipment carrying systems for over 40 years. Ondal equipment carrying systems seamlessly integrate medical devices, power, gases, video, and data signals into operating rooms and many other clinical areas. EIZO and Ondal are both leaders in design and development and have comprehensive quality management on all levels of production and processing. Both companies have been awarded industry quality certificates and permits for medical use. As "Original Design and Equipment Manufacturers" they can also develop and provide customized complete solutions beyond the requirements of OEM (Original Equipment Manufacturer) partners. Visitors to Medica 2010 in Düsseldorf, Germany can find out more about monitors and monitor carrying system solutions from EIZO and Ondal at the EIZO booth, Hall 10, #41. Ondal Industrietechnik GmbH, based in Hünfeld, Germany, is a company with 40 years of international experience in development and manufacturing of support systems for use in operating rooms, intensive care and many other clinical departments. As an "Original Design Manufacturer" and "Original Equipment Manufacturer" Ondal works with manufacturers. As well as a standard range of support systems, Ondal also develops completely new product solutions for medical technology. Ondal Industrietechnik GmbH has a worldwide presence with manufacturing and sales in the US and China. EIZO GmbH, Display Technologies is based in Karlsruhe, Germany and is a leading manufacturer of visual display solutions for medical imaging applications. The portfolio of the company includes color and grayscale monitors of 1 to 10 megapixels, image management systems and accessories. EIZO GmbH is a subsidiary of Eizo Nanao Corporation, a global leader in the manufacture of high-end monitors for medical and graphic design applications, financial trading, and other markets.